After a month and a half long painstaking process, we finally have the overall results of The Deli's Best of NYC 2011 Poll for Emerging Artists. Congrats to Caveman - who won the poll after being featured on the cover of the NYC Summer 2011 issue of The Deli. This fantastic band received a record number of votes from our jury of NYC scene makers (see list here), which sealed the deal since the early stages of the poll. Congrats also to Lucius, who will be featured on the cover of our Spring 2011 issue, since we never give the most coveted glossy page of The Deli to the same band more than once. Lucius - a female fronted alt-roots band we highlighted and booked several times in 2011 - earned the cover by winning the Readers' and Fans' Poll. But make no mistake: they fully deserve this prize, just go see them live tonight (01.25) at The Mercury lounge and you will understand why. Well done to dream-pop masters Widowspeak for their third place, sanctioned by lots of love from our jury and writers. Their stunning debut album on Captured Tracks Records was The Deli's Record of the Month in August 2011. Jurors (see list here) could freely pick any emerging NYC artists, and assigned 3 points to their first choice, 2 to the second and 1 to the third. 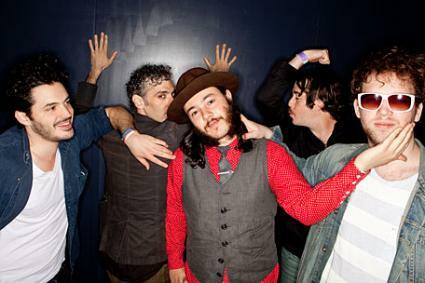 For example, Caveman scored 13 points by having 4 jurors choosing them as 1st band and one as third. Open Submissions - rated by Deli Editors from other cities - assigned 3 points to the overall winners (Grassfight), 2 points to the genre category winners, 1.5 points to the artists placing 2nd in the genre categories, and 1 to all the other ones. Under this column you'll also find bands that qualified through SonicBids. Since the number of bands competing in tha list is much smaller, we decided to assign them lower scores: 1.5 for the winner, 1.25 for 2nd place and 1 for all the other bands. Deli Writers were asked to cast 3 votes for any of the artists in the list of nominees compiled through Jurors picks and Open Submissions. Each vote was worth 1 point. Readers' and Fans' votes counted 0.001 points each, apart from the top 5 bands, rewarded respectively with 3, 2.5, 2, 1.5 and 1 points. Doubts? Feel free to ask questions via email at info @ thedelimagazine dot com!